This fantastic wedding was just the right sort of different – they knew they didn’t need to take the day seriously so made sure they, & their guests, enjoyed themselves above all else. There was humour, a heap of good DIY, history, a play on the idea of tradition, & a lot of laughter. They trolled their guests in a way that was so very many levels of awesome. The short version is, it was fun. In the invitations, they told their guests the wedding was a 70’s theme. What they didn’t mention was they meant the 1870’s! 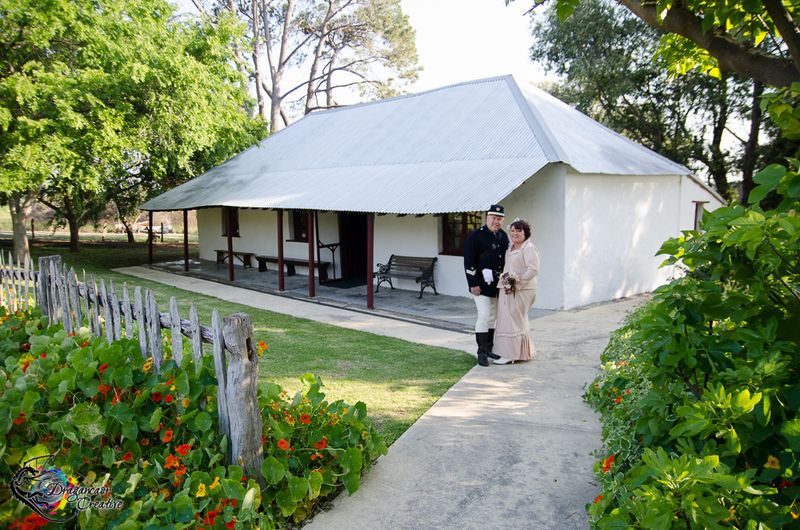 The venue was Cockman House, the original farmhouse in Wanneroo (Shire/Council in Perth, Western Australia) built in 1870 & now standing as a museum with original furniture & decorations of the family who built it & lived there. Judith & her now-husband Shaun are both historical re-enactors. I met them at the RSL through their WW1 living history group, but they are also members in a few others. Their wedding drew from Perth Volunteer Rifle and Artillery Regiment 1860, also known as The Regiment, who are a living history group who portray Western Australian volunteer soldiers from 1860-1901. Shaun wore an 1870s WA Police uniform, bearing the rank of Corporal. Judith wore a custom made dress of the same era. She made her own bouquet & hair piece. Their Celebrant, Terrance Weston, is not only a celebrant but also an Australian Army Chaplin & a member of the same living history group & his livery was that of the 1870s. Judith’s son gave his consent for them to be wed, playing into the idea of tradition, but his reading to follow the exchange of rings spoke of Dinosaurs in melted ice cages. I should also mention there was a fair bit of adlibbing in the ceremony – Judith told her son Brendon it was the “right answer,” and there was face pulling & broad gesturing throughout. After signing the register & doing the legal bit, two friends from the Regiment gave them a sword arch to walk through to their presentation as Husband & Wife. The wedding car was a friend with an old classic. Their photographer was me (who’d have guessed?!). The cake & all the food at the reception was made by friends. Judith also made all of the table decorations. But just as the guests had gotten used to the idea that the theme was actually the 1870s… the reception at the Bride & Groom’s home time-warped them all to the 1970s! They had multiple photo backdrops hanging from the fence & a couple of stands, a wooden heart-filled frame for guests to write on, a couple of mad-libs sheets for marriage advice, a single long table for all of the guests to share with them…. And down the side of the house was an Army tent from the Vietnam war, with some couches, a record player & some choice vinyl, in front of a soft drape leading to the disco. They’d converted their garage to look like the set of Saturday Night Fever, complete with laser lights, disco ball, & a karaoke jukebox! It was amazing! The bridal waltz was replaced with a fun dance to a medley of multiple, well known 1970s songs. Judith had a lovely Grecian dress with blue flowers & Shaun wore white patent heels with his pastel blue suit & ruffle shirt! Did I mention that this wedding was, by design, fun before all else?